Macau gambling junket boss Alvin Chau Cheok Wa’s Suncity Group Holdings Ltd says it has a deal to set up and run a casino in a resort in the Cambodian province of Sihanoukville. Suncity Group Holdings told the Hong Kong Stock Exchange on Monday that a subsidiary, Macau-based Suncity Group Management and Consultancy (Sihanoukville) Ltd – known as SGMC (Sihanoukville) for short – and the casino resort’s owner, Golden Sun Sky Entertainment Ltd, had finalised two agreements two days earlier. The first is for SGMC (Sihanoukville) to provide what were termed pre-opening and technical services for the casino. The second deal would see the Suncity Group Holdings subsidiary offer casino management services for a 20-year period to the property’s owner, once the venue opens. 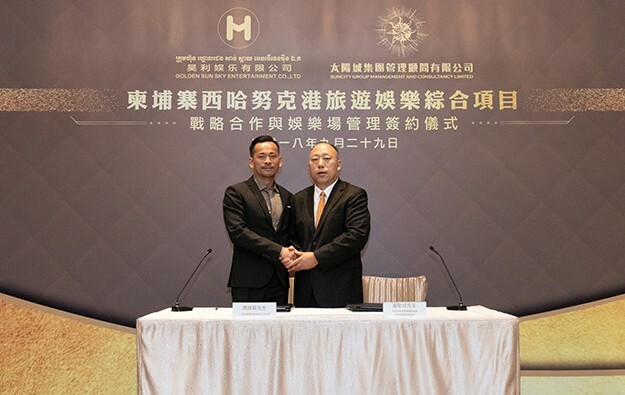 On September 5, Suncity Group Holdings said it had signed – via a subsidiary – a “strategic partnership framework agreement” with Golden Sun Sky. Last month’s announcement said the Cambodian venue would be at Otres Beach, a seaside settlement, in the city of Sihanoukville. According to Suncity Group Holdings, the project required investment of US$360 million and the property would probably open in the first quarter of 2020. Monday’s announcement stated the development would have a casino, hotel accommodation, restaurants, shops, housing, and facilities for sport and meetings. The casino resort will have a gross floor area of about 550,000 square metres (5.92 million sq feet), of which the casino will occupy some 120,000 sq ms. Suncity Group Holdings had previously mentioned the development would also include sport-betting facilities. Golden Sun Sky is a subsidiary of China Yunnan Jingcheng Group Co Ltd, a mainland China-based group with a diverse investment portfolio. Jingcheng Group describes itself as an investor in construction, tourism and aviation. The detail of this week’s announcement said SGMC (Sihanoukville) would be paid US$500,000 initially for 12 months of technical support. If further such support were needed after that phase, there would be a charge of US$41,667 a month. For running the casino, the owner would pay SGMC (Sihanoukville) 3 percent of the gross gaming revenue (GGR) each month, and 5 percent or 6 percent of the annual earnings of the casino from gaming, the percentage depending on whether the annual earnings are greater or fewer than one-fifth of GGR. Suncity Group is said by analysts to be one of the biggest-single investors in junket room operations in Macau, although the Hong Kong-listed entity of the brand does not encompass the profit streams of junket operations for privately-held Suncity Group. Suncity reported a net loss of nearly CNY1.65 billion (US$241.8 million) for the first half of this year, compared with a CNY632.3-million loss in the same period last year.